Spy satellites are robotic observational platforms that orbit the Earth in order to image its surface and to record radio signals for military and political purposes. They transmit their data to Earth, where it is interpreted by specialists in centralized, secretive facilities such as the U.S. National Photographic Interpretation Center in Washington, D.C. Spy satellites have been essential not only to military operations and the formation of national policy but to the verification of arms control treaties such as SALT I, SALT II, and the Comprehensive Test Ban Treaty. Israel launched the Ofek-5 spy satellite at a coastal air force base south of Tel Aviv in 2002 to exted its ability to monitor developments in the region. take pictures in visible and infrared light, (2) infrared telescopes designed to detect missile launches, (3) radars that image sea or land even through cloud cover and in darkness, and (4) signals intelligence (SIGINT) satellites (also termed "ferrets"), which are optimized either for characterizing ground-based radar systems or for eavesdropping on communications. Sometimes photoreconnaissance and SIGINT functions are combined in single, massive platforms such as the U.S. Keyhole-series satellites. Although a number of nations have launched spy satellites, the U.S. and the Soviet Union are responsible for by far the greatest number. The Russian Federation, which inherited most of the Soviet Union's space system after 1991, has been unable to afford the cost of adequately updating its spy satellite network. In contrast, the U.S. has continued to deploy ever-more-sophisticated systems in a steady stream. Thus, the majority of spy satellites in orbit today, including all the most capable units, are U.S.-owned. Although the precise technical capabilities (and in many cases even the basic missions and orbits) of U.S. spy satellites are secret, it is thought that the best U.S. visible-light spy satellites are capable, given clear skies, of imaging surface features only a few centimeters across. A modern U.S. spy satellite can, given clear skies and a good viewing angle, probably read a license plate from space. The U.S. began developing spy satellites in the mid-1950s, years before it had a rocket capable of placing anything in orbit. As early as 1946, RAND (short for the RAND or R esearch an d D evelopment Corporations, a think tank created by Douglas Aircraft Co. that was influential throughout the Cold War) had produced a report entitled "Preliminary Design of an Experimental World-Circling Spaceship." The usefulness of such systems was obvious long before they were buildable, for military forces had been seeking higher vantage points from which to observe the enemy ever since the U.S. Civil War, when the Union experimented with tethered observation balloons overlooking Confederate positions. In the early twentieth century, reconnaissance blossomed when photographic film replaced cumbersome glass plates and cameras were borne aloft on aircraft. So effective is aerial photography that it is still used today; the U.S., for example, continues to employ its high-altitude U-2 and SR-71 Blackbird aircraft, early versions of which it developed in the 1950s and 1960s. However, spy planes have limitations. Even the highest-flying airplane cannot fly above the atmosphere, and can therefore, view only a limited amount of ground at any one time. Even at four times the speed of sound (the approximate top speed of an SR-71), this is a severe disadvantage when trying to surveil a country as large as China or Russia. Nor can planes be kept aloft indefinitely; they must be sent out at intervals. They must also be piloted, putting crew members at risk of death or capture. This was illustrated most famously in 1960, when CIA pilot Gary Powers was shot down while flying a U-2 spy plane over the Soviet Union and tried for espionage. (In recent years, robotic aircraft have been employed for some shortrange aerial reconnaissance.) Finally, spy planes are intrinsically illegal in time of peace—they must violate national airspace to do their job—and therefore, a political liability. Spy satellites overcome all the limitations of spy planes. A network of three geosynchronous satellites can, in contrast to the occasional glimpses provided by spy planes, keep the entire world in view at all times. (A geosynchronous satellite orbits 22,160 mi [35,663 km] above the equator in the direction of the Earth's rotation, matching its movement with the Earth's surface so that it appears to hover at a fixed point in the sky.) A network of lower-altitude satellites in polar orbits (i.e., circling at right angles to the equator, over the poles) can, by combining their smaller fields of view, do the same. Also, satellites are at an altitude too high to be easily shot down, though the U.S. and Russia have developed anti-satellite weapons in case they should ever wish to do so. Finally, satellites are legal: they do not violate national airspace. This legal point was not always universally acknowledged; for a few months in 1960 the Soviet Union complained that U.S. spy satellites were violating its airspace, which, it said, extended upward indefinitely from its territory. It dropped this argument when it began launching its own spy satellites in October, several months after the United States. The U.S. Air Force and Central Intelligence Agency (CIA) were early advocates of satellite surveillance. ("Surveillance," strictly speaking, refers to the passive, ongoing observation of some area to scan for activities or changes of interest, while "reconnaissance" refers to the active seeking of specific information at a particular time; however, the word "surveillance" is often used to cover both activities.) A detailed study released by RAND in 1954 suggested two basic methods for returning imagery to Earth from an orbiting platform: (1) television pictures scanned from photographic film on board a spacecraft and beamed to Earth, and (2) return of the film itself to Earth in a reentry vehicle. The Air Force decided to develop the first option, arguing that retrieving film from space would be time-consuming and unreliable; the CIA decided to develop the second, reasoning that TV technology was still too crude to give sufficiently high-resolution pictures. Squabbling between the Air Force and CIA, both jockeying for control of U.S. space surveillance resources, eventually moved President Dwight Eisenhower to create the National Reconnaissance Office (NRO) on August 25,1960. Then NRO (officially secret until the early 1990s) is staffed by personnel from the Air Force, CIA, and other government agencies and is charged with overseeing the United States's space-surveillance programs. Under the NRO's guidance, three major spy-satellite programs went ahead in the early 1960s, one directed by the CIA and two by the Air Force. The CIA's system, code-named Corona, took high-resolution photographic negatives with orbiting telescopic cameras and then dropped them to the Earth. The first 12 attempts to achieve orbit or return film all failed, but starting with Corona 13 in August, 1960, Corona began to fulfill its promise. A long series of Corona satellites were launched, orbited over the Soviet Union, and returned their exposed film in reentry capsules. Each capsule deployed a parachute after it had killed most of its velocity by friction with the atmosphere, and was then hooked from the air by a propeller-driven JC-130B aircraft flying at about 150 miles per hour (242 km/hr). The Corona satellites returned excellent images, with later models probably achieving a resolution of about 1 foot (.3 m). One of Corona's first achievements was to debunk the Air Force's claims that a huge "missile gap" existed in the early 1960s between the Soviet Union and the U.S.—that is, that the Soviets many more ICBMs (intercontinental ballistic missiles) than the U.S. In fact, as Corona showed, the Soviets actually had far fewer missiles than the U.S. at that time. Because each Corona satellite had a limited film supply, it remained in orbit only for hours or a few days, requiring that a new Corona be launched each time a new set of photographs was desired. Corona, therefore, did not keep the Soviet Union under constant surveillance, but instead ran a series of reconnaissance missions with specific goals. Over 120 Corona satellites were flown before being replaced in the early 1970s by the larger and more sophisticated film-return satellite known as KH-9 HEXAGON (or "Big Bird"). The two spy-satellite programs pursued by the U.S. Air Force in the early 1960s were SAMOS (Satellite and Missile Observation System) and MIDAS (Missile Alarm Defense System). SAMOS satellites took pictures on film, developed the film in orbit, and transmitted TV scans of the pictures to Earth. Because the TV pictures were much blurrier than the film, SAMOS had low resolution even for its day (5–20 feet), and some authorities (e.g., Herbert Scoville, Jr. [1915–1985], arms-control expert and onetime CIA analyst) have claimed that SAMOS never produced useful data. It was not until the 1970s, with the launch of the KH-11 spy satellite (discussed further below), that radio return of data from orbit was to provide images as good as those available directly from film. The first successful SAMOS launch was on January 31, 1961; 26 more SAMOS satellites were launched between then and November 27, 1963, when the program ended. Meanwhile, the Soviet Union was launching its own series of low-orbit photoreconnaissance satellites, the Cosmos platforms. Like Corona, the Cosmos satellites were film-return missions—a technique that the Soviet Union (and, later, the Russian Federation) would continue to use until 2000, when the Enisei satellite, designed to return high-resolution digital images in real time like the United States's KH-11 and KH-12 satellites, was launched. The Cosmos were modified Vostok capsules originally designed to carry cosmonauts, rather than specialized platforms. (Later, the Soviets would also modify their larger Soyuz capsules for use as robotic spy satellites). Use of Vostok capsules had the advantage that the Soviets did not have to invent a separate film-return system, having already developed techniques for landing Vostok capsules by parachute. Corona, SAMOS, and Cosmos followed polar orbits at altitudes of about 150 miles, circling Earth every 90 minutes or so. (Satellites at lower altitudes get a closer view but encounter atmospheric drag that shortens their lifetimes, eventually burning them up like meteors; spy satellites have been orbited as low as 76 miles, but they did not last long.) A polar-orbiting photoreconnaissance satellite views a limited portion of the surface at any one time, although its field of view moves rapidly over the Earth as the satellite speeds through space. MIDAS, the U.S. Air Force's other early spy-satellite project, was different. Each MIDAS satellite was stationed at a much altitudes (e.g., 2170 mi [3500 km]), from which it could see most or all of the Soviet Union at any moment. The MIDAS satellites were designed not to take visible-light images of the Earth, but to observe it in the infrared band of the electromagnetic spectrum. The goal was to detect the heat radiation (infrared light) given off by missile and rocket launches; MIDAS could radio warning of an attack to Earth long before ground-based radars could detect approaching missiles. Twelve attempts to orbit MIDAS satellites were made between February, 1960, and October, 1966. Most failed, but experience with MIDAS made possible its successor, the Defense Support Program (DSP) system of geosynchronous infrared early-warning satellites. The first DSP early-warning satellite was launched in 1970, the nineteenth in 1999. Unlike their predecessors, the MIDAS satellites, DSP satellites are deployed to geosynchronous orbits. Five are usually in operation at any one time: the three newest are used to observe parts of the Earth deemed most likely to be missile launch sites (e.g., Russia), while the two oldest are used both to observe less-critical areas and as backups for the first three. When a new DSP satellite is launched, the most obsolete of the five already in orbit is nudged by its rockets to a higher orbit in order to avoid cluttering the geosynchronous altitude. DSP satellites combine high resolution with wide-area coverage by a mechanical trick. The field-of-view of a DSP satellite's telescope is much smaller than the disk of the Earth, but the telescope is mounted at an slight angle to the long axis of the satellite, which is caused to spin at .175 revolutions per second. The working satellite thus resembles a rolling bottle with an off-angle straw protruding from its mouth, where the straw corresponds to the telescope and is pointed toward Earth. The telescope's field of view is wobbled systematically over a larger area of the Earth than it would view if the satellite were stationary. The data collected by DSP satellites are compressed by on-board computers and then transmitted to a data-collection station at Nurrungar, Australia, where they are analyzed in real time. This system underwent an unplanned but crucial test in 1979, when a computer tape simulating an all-out Soviet nuclear attack was mistakenly fed into the early-warning system of the U.S. Strategic Air Command's control center in Colorado. Controllers assumed that a real attack was occurring, and U.S. ballistic-missile crews prepared to launch in retaliation. War was averted because U.S. leaders took the precautionary step of viewing real-time date from the DSP satellite system, which showed that no launches had actually occurred in the Soviet Union. The Soviet Union, although always lagging the U.S. technologically, has also deployed infrared early-warning satellites. By the early 1990s, it had several "Prognoz" satellites in geosynchronous orbits doing the same job as the United States's DSP satellites. It also had a collection of nine "Oko" (Russian for "eye") satellites, also infrared early-warning platforms, in elliptical (off-center) orbits. The latter were designed to observe the missile fields of the continental U.S. at a grazing angle. The advantage of such a view for early warning is that U.S. missiles would, within seconds of liftoff, be silhouetted against the blackness of space, making them easier to detect. Today, only one Prognoz early-warning infrared satellite remains operational. To decrease the likelihood of a Russian ballistic-missile launch due to flawed or inadequate information, some experts have proposed that the U.S. and Russia set up a joint early-warning center where the U.S. would share its DSP data with Russian observers. A dozen Keyhole satellite designs have been orbited to date, each generation containing a significant improvement over its predecessor. In the days when each satellite (whether a "bucket dropper"—film-return—type or TV-scanning type) carried a finite supply of photographic film, satellite lifespans were short and large numbers of each type were launched. For example, 46 copies of the KH-5 satellite (the immediate successor to the Air Force's SAMOS) were launched from 1963 to 1967. Thirty-six copies of Corona's successor, the KH-6, were orbited during the same period. The two satellite types were used in conjunction; low-resolution, wide-area images from a KH-5 would be used to identify targets for high-resolution, "close-look" reconnaissance by a KH-6. The next close-look satellite, the KH-8 (still a bucket-dropper), was the first spy satellite to examine bands of the electromagnetic spectrum other than the visual-light band. Since the KH-8, all Keyhole satellites have examined light in several narrow bands in the visible and infrared parts of the spectrum. This is done in order to extract maximum information about ground features. A different lens must be used for each wavelength, as a single lens cannot focus all wavelengths simultaneously. This adds to the complexity and cost of each satellite, but increases its usefulness greatly. The most famous Keyhole satellite type is the KH-11, the primary U.S. orbital imaging platform from 1976 to 1992 (when it was succeeded by the KH-12, still in service today). The KH-11 finally achieved the ambition of SAMOS's designers: to return film-quality images from orbit electronically, without bucket-dropping. The invention of the charge-coupled device (CCD) in 1970 was key to this advance, and has transformed astronomy as well. A CCD is a microchip (i.e., a thin rectangle consisting mostly of silicon or another semiconductor, >.5 in 2 ); one side of the chip is an array of thousands of microscopic electronic devices that record photon impacts as electrical charges. (A photon is the minimum unit of light.) Placing a CCD in the focal plane of a telescope and periodically reading off the contents of its array of photon sensors produces a digital image record. The CCD is thus the equivalent of the film in a conventional camera, with the difference that a CCD can be re-used indefinitely. The image information from a CCD is stored in digital form. Digital information, unlike the analog TV signals from the original SAMOS, is easy to encrypt and to transmit without loss of quality. Furthermore, the abandonment of bucket-dropping meant that spy satellites could remain in orbit for years rather than weeks. This, in turn, has made it feasible to invest more money in each satellite, making it more complex and capable. (A modern KH satellite costs about a billion dollars.) SIGINT antennas were added to KH-11s as the series progressed, to eavesdrop on communications. KH-11 and KH-12 satellites are also highly maneuverable. A KH-12 satellite carries some seven tons of hydrazine fuel with which to maintain its orbital altitude against atmospheric drag or to change its orbit in order to better view specific parts of the Earth. SIGINT and ferrets. Signals intelligence (SIGINT) is divided into three sub-fields: communications intelligence (COMINT, the interception of messages), electronics intelligence (ELINT, the gathering of information about radar, radar jammers, and the like), and telemetry intelligence (TELINT). TELINT is in fact a special type of COMINT. Telemetry is data about physical quantities measured by automatic devices, often embedded in missiles, spacecraft, or aircraft. When a new ballistic missile is tested, say by China, it radios a complex telemetry stream to the ground from the moment of its launch until it crashes or explodes. The telemetry stream is intended to show the missile's designers exactly how the new machine is performing and, if it fails, what components caused the failure. (As a famous unclassified example, analysis of routinely-recorded telemetry from the space shuttle Columbia was essential to understanding the causes of that spacecraft's explosion during reentry in 2003.) The telemetry—once decoded, a task accomplished by the U.S. National Security Agency (NSA) or a foreign equivalent—also reveals the detailed mechanics of the missile to TELINT eavesdroppers: fuel consumption, acceleration, guidance, and the like. TELINT and COMINT collection are the primary missions of the U.S. Rhyolite series of satellites (also termed Aquacade), the first of which was launched in 1973. The Rhyolites are also thought to collect some ELINT (radar mapping data). Rhyolites must observe the Earth continuously in order to eavesdrop effectively on communications sessions, which usually last more than the few minutes that a fast-moving, low-altitude satellite is in range, and on telemetry from missile tests, which take place at unpredictable times. They are therefore parked in geosynchronous orbits. Once in orbit, a Rhyolite unfolds a dish-shaped receiving antenna approximately 70 feet (21m) across and begins listening. From its altitude of over 22,000 miles (35,400 km), a Rhyolite can pick up walkie-talkie conversations on Earth—and perhaps even weaker signals. Other large, geosynchronous SIGINT satellites have been orbited by the U.S., with missions similar to Rhyolite's. Also, as mentioned above, the KH-11 and KH-12 series satellites have carried SIGINT as well as photoreconnaissance equipment. There is little that is transmitted electronically that cannot be intercepted by the United States's SIGINT satellites. The Soviet Union also launched numerous SIGINT satellites, emphasizing continuous coverage of the oceans and of North Atlantic Treaty Organization (NATO) countries by networks of low-orbiting satellites rather than by fewer, more sensitive satellites in geosynchronous orbits. Like other spy-satellite assets inherited by the Russian Federation from the Soviet Union, these SIGINT resources have degraded steadily, with many satellites falling out of service without replacement. An important class of SIGINT satellites is dedicated to characterizing on-the-ground radar systems, including early-warning, missile-tracking, naval, civil, and other radars. Because radar systems are designed to radiate large amounts of electromagnetic energy, their detection is straightforward compared to the gathering of COMINT, and relatively small, cheap satellites suffice. Satellites or aircraft that specialize in characterizing enemy radars are termed "ferrets." Many ferrets have been launched since the first U.S. ferret in May 1962; some experts estimate that SIGINT satellites, including ferrets, are about four times as numerous as photoreconnaissance satellites. At least eight U.S. ferrets are orbiting the Earth at any one time, many in geosynchronous orbits or in highly elliptical orbits. The advantage of an elliptical orbit for ferreting is that when the satellite is near its apogee (i.e., when it is farthest from the Earth), its velocity is very low. By positioning the orbit so that its apogee is above an area of interest, Siberia, for example, the satellite can be made to "hang" for hours above that area, gathering continuous data. At the same time, elliptical orbits do not require as much energy to achieve as geosynchronous orbits, and so are cheaper. Radar Satellites. Both the U.S. and the Soviet Union have launched satellites that map the Earth and track ships at sea using radar. Radar satellites, unlike visual-light satellites, can image at night and through clouds. Orbital radar imaging was first tested by the U.S. on a 1984 flight of the space shuttle Challenger , and was used with great success by the Magellan mission to Venus, launched 1989. Beginning in 2008, an ambitious U.S. program dubbed Discoverer II will orbit a constellation of low-orbit satellites called the Space-Based Radar (SBR) Objective System. The 24 satellites of the SBR Objective System will provide continuous, real-time, high-resolution radar imaging of the entire world, additionally supplying super-high-resolution imaging of a smaller area using side-looking synthetic-aperture radar (SAR). The ordinary radar footprint (area of view) of an SBR Objective System satellite will be a circle about the width of the continental United States; the footprint of its SAR will be about a quarter as large, shaped like a pair of butterfly wings aligned with the direction of travel of the satellite. These "wings" will slide along the ground with the satellite, defining a double track of territory that can be mapped by SAR. The SBR Objective System will provide real-time precision terrain mapping and tracking of vehicles moving on the ground, in the air, or at sea. (Radar cannot penetrate water, so submarines will not be observed.) Unlike older photoreconnaissance systems, which transmitted their information solely to centralized interpretation centers, information from the SBR Objective System will also be downlinked directly to commanders in the field. Testing of SBR Objective System satellite prototypes begin in 2004. Space-Based Infrared Satellite Systems. An important U.S. satellite system that is now in the process of development is the Space-Based Infrared Satellite System (SBIRS), which is intended to replace the aging DSP early-warning system. SBIRS is intended not only to detect launches, but also to provide detailed tracking information that could be used in antiballistic missile defense. SBIRS will have two components, SBIRS High and SBIRS Low. SBIRS High will consist of satellites in geosynchronous and highly elliptical orbits, much like DSP, but with increased sensitivity. SBIRS Low will consist of a constellation of low-orbit satellites—probably 24, like the SBR Objective System— that will use infrared sensors to track missiles' trajectories for the purpose of guiding defensive systems such as interceptor missiles. Whether the proposed antiballistic missile system of which SBIRS Low would be a part would be effective is technically controversial. The first SBIRS High satellite was scheduled for launch in 2003, and the first SBIRS Low for about 2008. Other developments. Although the U.S. and the Soviet Union had a monopoly on satellite launches during the 1960s, this began to change in 1970, when both China and Japan orbited their first satellites. Neither was a spy satellite: Japan had vowed to conduct a strictly nonmilitary space program, while the Chinese launch, like the Soviet Union's 1957 Sputnik, was a demonstration. (Its sole function was to broadcast a tape recording of the Chinese Communist anthem, "The East Is Red"). However, China was soon launching military satellites, and by 1999, claimed to possess a network of 17 spy satellites that monitor the U.S. military continuously. Japan launched its first two spy satellites in 2003, breaking its self-imposed ban on military space projects in order to spy on North Korea's efforts to develop ballistic missiles and nuclear weapons. 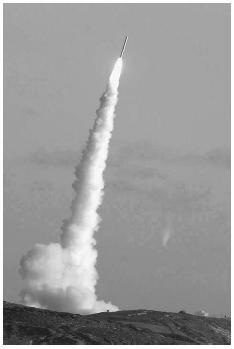 India launched its first spy satellite, the Technology Experiment Satellite (officially experimental, but viewed by space experts as a surveillance platform) in 2001. Israel orbited its first spy satellite (Ofek 3, a photo-reconnaissance platform) in April 1995. For about one and a half years in 2000–2002, the demise of Ofek 3's successor, Ofek 4, left Israel without a national spy satellite system. During that period, it compensated by buying high-quality imagery from a civilian U.S. Earth-imaging satellite, Landsat. The quality of such imagery approaches that of the best spy-satellite imagery available to the U.S. or Soviet Union during the 1960s. As images from Landsat, Ikonos (a commercial U.S. satellite launched in 1999), and the French-owned SPOT (Système Probatoire d'Observation de la Terre) satellites are now available, anyone who can afford the per-image cost now has, in effect, significant satellite capability, whether for scientific or military purposes. Surveillance is in the eye of the beholder: an image is an image, whether produced by a "nonmilitary" or "spy" satellite. This was underlined during the U.S. war with Afghanistan in October 2001, when the U.S. government took the unprecedented step of buying exclusive rights to all Ikonos satellite images of Afghanistan in order to prevent them from being purchased by media outlets. It is likely that space imagery will continue to become more widely available as launch capabilities and imaging satellites proliferate, making it less feasible to control its distribution. Just as nonmilitary orbital imaging systems are increasingly of military significance, military imaging systems are increasingly finding nonmilitary application. The DSP satellites have greatly augmented astronomers' catalogs of infrared stars. The SBIRS may be used to catalogue near-Earth asteroids to predict and possibly fend off a catastrophic collision; and after the loss of the space shuttle Columbia in 2003, NASA contracted with the U.S. National Imagery and Mapping Agency to routinely photograph shuttles in flight. Burrows, William E. Deep Black: Space Espionage and National Security. New York: Random House, 1986. Campbell, Duncan. "U.S. Buys up All Satellite War Images." The Guardian (London). October 17, 2001. Dooling, Dave. "Space Sentries." IEEE Spectrum (September, 1997): 50–59. Duchak, G. D. "Discoverer II: A Space Architecture for Information Dominance." Aerospace Conference Proceedings (Vol. 7), IEEE, 1998: 9–17. Forden, Geoffrey, Pavel Podvig, and Theodore A. Postol. "False Alarm, Nuclear Danger." IEEE Spectrum (March, 2000): 31–39. Slatterly, James E., and Paul R. Cooley. "Space-Based Infrared Satellite System (SBIRS) Requirements Management." Aerospace Conference Proceedings IEEE, 1998: 223–32.